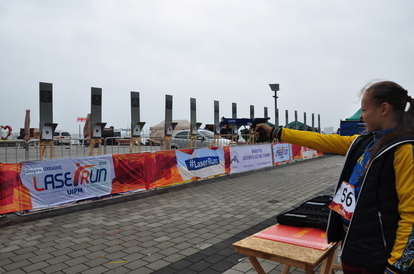 Another Global Laser Run City Tour in Ukraine, another day of adverse weather conditions, another example of hundreds of racers refusing to be denied their chance to try UIPM’s fastest-growing development sport. A storm warning was issued by the local meteorological office on September 9, the day of the event in Dnipro, and for the third time this year in Ukraine, the weather could hardly have been worse for a Global Laser Run City Tour. On the flip side, the spirit on display could hardly have been higher. Festival Quay provided an attractive venue for the competition and 261 competitors attended, many of them with experience of pentathlon. The Vice President of the Ukrainian Modern Pentathlon Federation, Sergey Timarev, made a welcome speech in which he thanked everybody for braving the weather on such a special occasion. This was one of two City Tours that coincided with the 1st Pierre de Coubertin Pentathlon Day, a global celebration of the pentathlon movement and the heritage created by its founder. There were numerous races on the day with youth, senior and Masters categories, as well as an elite race for the experienced pentathletes. Sergey Timarev said: “Because of the support of the UIPM and Alexandr Petrovsky’s Solidarnist welfare fund, we have been able to celebrate the first #PentathlonDay like real pentathletes – just like the elite athletes competing at the World Championships in Mexico City. A spokesperson for the local organizing committee added: “With excellent organization, happy athletes and coaches, great atmosphere, a knowledgeable team, laser equipment from the UIPM and sponsorship support, the Global Laser Run City Tour in Dnipro was one of the most memorable competitions of the season for Ukrainian athletes.